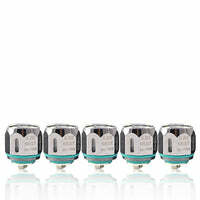 Made for use with the Manta Sub Ohm Tank family from Advken, this five pack of coils is going to offer up a whole bunch of versatility that will be able to keep you happily vaping in the long run. Don't find yourself stressed out, struggling to find coils when you need them the very most. This five pack will make it so that you are well stocked up and able to always get that flavor and impact that you desire without having to stress or worry about anything at all. When you have coils around for back up use, there is a certain peace of mind that you get that is absolutely priceless. Whenever you can vape with these you will see that your juices give the effect that they are truly meant to provide you with. The taste, the texture, and the effectiveness is improved upon greatly and will add new life to your collection. Advken is a really interesting collection that makes some fantastic vaping options that are always at the absolute forefront of technology and the ability to make you feel giddy to be able to use them. Their quality truly is second to none and the price that they offer up all of their selections at is second to none. The Manta Tank Mesh Replacement Coils come in a 0.16 ohm rating and are meant for use between 60 and 80 watts as well as a 0.2 ohm rating that is meant for between 50 and 70 watts.